May has been a great month at the Sea Hag. We’ve had several excellent tournaments, among them the Shands Reeling for Kids tournament and the Perry Optimist Club tournament. Some pics from the tournaments are seen below. The inshore fishing has been a little inconsistent at times, but with persistence and moving around a bit, some fine catches were made. Gene Breeze caught this fine trout on a trip late in the month. 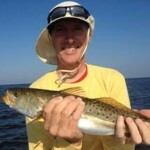 The redfish action was the most inconsistent, with either feast or famine for much of the month. Trout, however, were available in great numbers, although there are lots of short fish to cull. Offshore, amberjack and red grouper were the targets, but kingfish and cobia came in to the cleaning tables as well as great catches of Florida snapper. Offshore, the biggest loss will be the closing of amberjack season, but to make up for it, red snapper season is open! Red grouper are plentiful (as are gags, which must be released for another month unless caught in state waters). Kingfish, cobia and Florida snapper are available as well in good numbers. 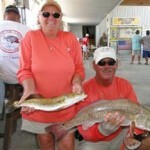 The grouper are plentiful in waters between 50 and 70 feet, on either live pinfish, cut bait or squid. Always put out a live bait on a flat line for kingfish or cobia when bottom fishing. Inshore, most good trout catches will be made in 3 to 5 feet drifting through potholes and sand patches, or in 5 to 7 feet over mixed bottom. Particularly good areas have been west of Pepperfish Keys to the south and near the Bird Rack in front of Big Grass Island to the north. Fish jig and Gulp baits slowly near the bottom. For shallower fishing, try topwater plugs, suspending lures, or DOA shrimp jumped off the bottom near potholes. It should be a great month as everyone gets ready for the opening of scallop season on July 1. If you don’t have accommodations for the busy season, now’s your chance to sign up. The Sea Hag Marina can provide some fine accommodations, from the newly renovated Sea Hag Shacks to waterfront lodgings with hot tubs overlooking the river. Call today. To keep everyone straight on the most recent regulations, here are the up-to-date regs. You will note that between July 1 and July 10, both red snapper and gag grouper are open. Offshore charters will be hard to come by during that time, so get in touch with one of our excellent offshore guides very soon to book a great trip. Additionally, the biggest tournament of the season will take place on June 8 and 9, the Doug Johnson Reeling for Kids Tournament to benefit the Boys and Girls Clubs of Alachua County. For more information, see the website and go ahead and sign up. It’s a great tournament for all. 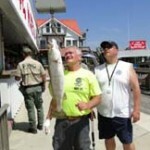 RED SNAPPER: JUNE 1-JULY 10, 2 PER PERSON, MINIMUM SIZE 16 INCHES.